Ok lets be honest for a minute, I haven’t shopped at Urban Outfitters since I was in high school. I’ve peeked my head in their store from time to time since then, but always thought they were overpriced and pretty conformant to the masses. It wasn’t until last summer when I stopped in to make a return on an online shoe purchase, that I saw a dress I fell in love with! I then tried it on and fell even deeper in love with that dress! I actually did a whole post on how much I love that dress here. After that, I always check their online site regularly, because if I can fall in love with one of their dresses like that, then surely I can find something else that will melt my heart too. Enter in this sweater…. The sleeves are the first things that grabbed me on this sweater. Different colored dolman sleeves, oh my! But it is extremely soft; it fits just right, and pairs well with all because it is basically a neutral palette of colors. It was also only $39, which doesn’t make me feel bad about buying it not on sale. Although this version is now sold out, there is a similar multi-colored sleeve one that I’ve linked above, and there are one-colored versions as well. I don’t consider myself tall, and even though this sweater is really oversized, I still think it looks great. 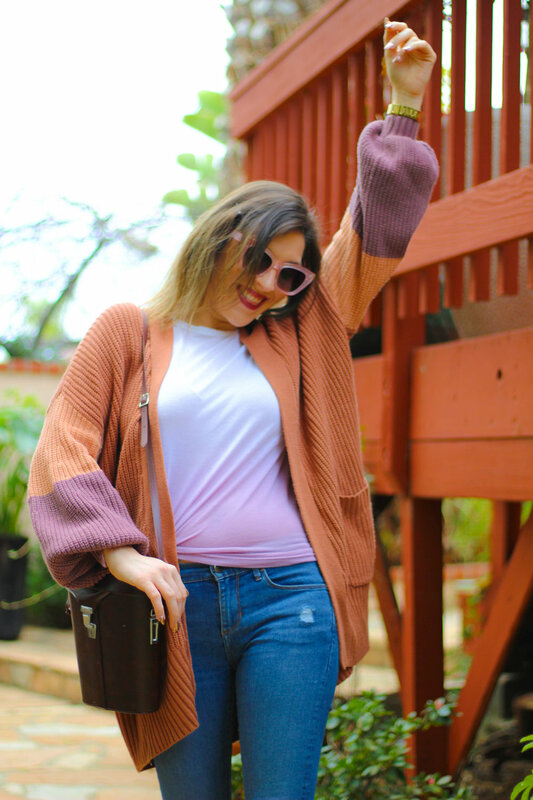 It has that casual yet put together thing going on which I love in a sweater, or anything! I have linked below some of my other current favorite sweaters from Urban Outfitters below! Enjoy!